Spring brings us the early, earthy hints of green goodness that mark the beginning of the summer garden. Sweet peas, funky favas, luscious artichokes and piles of herbs are such welcome tastes after a winter of roots and stews. So funny, then, that what I wanted from this early bounty was a stew. Vignarola, specifically. A famous Roman dish that welcomes spring. One I have never had the pleasure of eating in its rightful place, but have cooked with what I consider success. So I will continue in my blissful ignorance until the day I get to taste the OG magic on Italian soil. 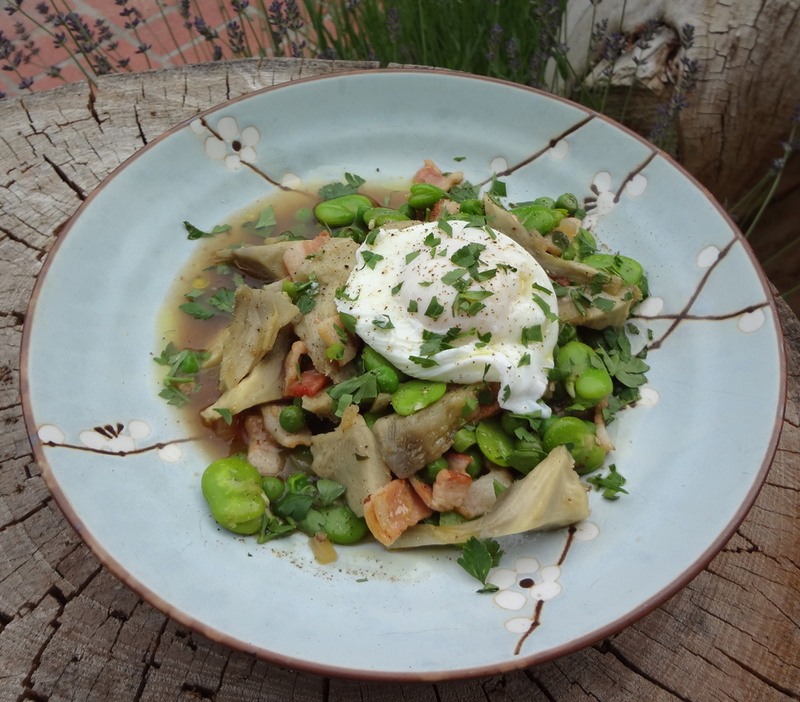 Many recipes will peel the artichokes until left with the hearts which get simmered and stewed in a broth made from guanciale, wine and onions before the delicate fresh favas and peas and stirred in. I have made it this way with success though I felt bad about wasting the leaves. I also made a great version using jarred artichokes. I separated the hearts and leaves, simmering the leaves with water and onion, then blending and straining to make the broth. That was the most intensely artichoke thing I have ever eaten and it was great on a rainy day. This time I decided to steam the artichokes so we could eat the leaves first as an appetizer. I figured I could use the steaming water which would most likely take on some flavor. As a bonus time saver I blanched the favas in the water first, skimming them out with a strainer before cooking the artichokes. I threw in an onion and bay leaf figuring that could not hurt and steamed the artichokes about 55 minutes. Meanwhile I sauteed some onion and pancetta as I did not have any guanciale- which is the typical ingredient. I added 2 cups of the broth and simmered another 20 minutes to really bring out the smokey pancetta flavor into the broth. I had meanwhile peeled the leaves from the artichokes and cut the hearts into slices. 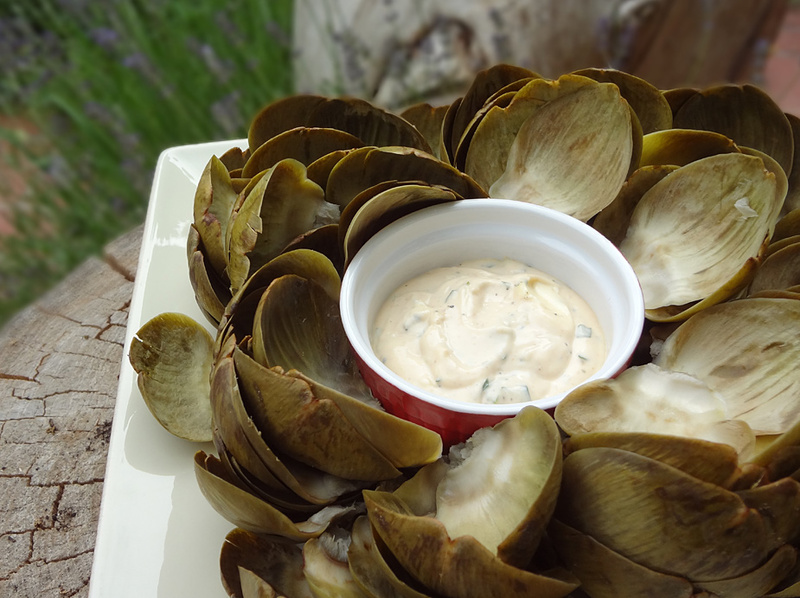 I had made an aioli for the artichokes and we were able to snack while I pulled the rest together. We were also having a grilled New York strip steak for dinner so Ryan seasoned it and got it on the grill. Since we were splitting a small steak three ways, I ended up throwing some water in a pan to poach some eggs which I thought would be awesome on top of the stew. Once the water was boiling for the eggs I threw the favas, peas and artichokes hearts into the broth for about five minutes. The steak came in to rest before slicing. The eggs topped the stew. Crusty bread appeared on the side. A perfect spring meal. Put 4 cups water in a big pot and bring to a boil. Have a bowl of ice water ready. Remove favas from pods, rinse well and add to water for about a minute. Remove with slotted spoon/strainer to ice water. Put quartered half onion and bay leaf in pot. If you have a steamer basket that fits in pot place it on top of onions. Otherwise, put artichokes directly on onions. Cover and steam until leaves are easy to remove – about 45-55 minutes. Meanwhile, mix all aioli ingredients well. It is better once it has been sitting a while. Once favas are cool, remove outer skins and set aside. Remove artichokes and let cool reserving 2 cups of liquid. Strain and season to taste with salt. Peel the dark green artichoke leaves arranging them on a plate with aioli to snack on while you assemble the rest of dinner. With a paring knife, remove pale inner leaves and choke and cut hearts into slices or wedges. Add 4 T oil to dutch oven or medium pot and cook guanciale (or pancetta) until just starting to brown and remove to a bowl. If using bacon, omit oil and cook in dry pot until almost brown and pour off all but 4 T fat. Cook onions in fat over medium heat until just starting to brown. Add garlic for a couple minutes. Return guanciale to pot and add artichoke broth and simmer about 10 minutes. Add artichokes, favas and peas and simmer another 5 minutes. Adjust for salt and dish into bowls. Top with black pepper, parsley and a drizzle of high quality olive oil. If you choose, you can serve a poached or fried egg on top with crusty bread on the side. We ate it as a side dish to grilled rib eye which was wonderful with the aioil. This entry was posted in Eggs, Italian, My Favorite Things by Marina Chotzinoff. Bookmark the permalink.